I'm simply not impressed with this candle. It's too small, the scent isn't there, and it leaves a waxy film on the skin that has to be scrubbed off. Even if this candle was available in a larger size I still wouldn't purchase it due to the waxiness. It moisturizes due to the shea butter but it's too much of a mess to clean off, and with all the scrubbing to remove it you'll strip the moisture from your skin anyway. This one just wasn't for me. Tiny, Light Scent, Only A Few Uses, More Prone To Getting Knocked Over! 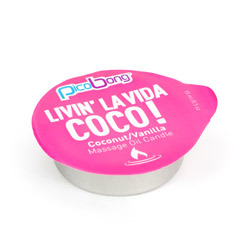 These teeny tiny massage candles from Picobong make sweet little gifts for couples or anyone that enjoys a warm glow of a candle. I like that these are small, inexpensive, and make the perfect add on to a spa/gift basket. There are definitely some downsides to this little candle though. If you've never tried a massage candle before or want to experiment with wax play this is a great way to get started without spending too much. Light the candle until a pool of oil forms, then use the oil to give your partner (or you can use it on yourself!) a warm, sensuous, relaxing massage. The warm glow of the candle works well to set a romantic mood. Be mindful when having an open flame in the bedroom though! Use common sense and enjoy the glow from the little flickering flame. 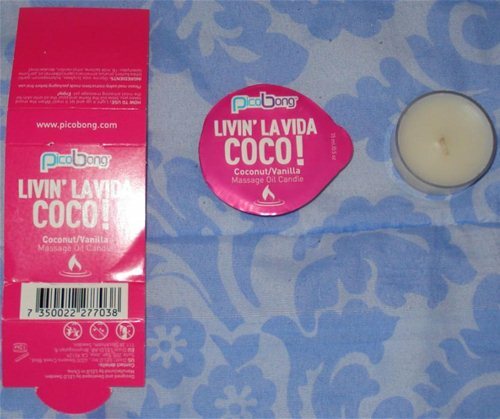 The coconut vanilla scent is yummy, especially if you're craving a little piece of summer paradise. When the wax melts into oil it feels really nice at first. It's warm without being scalding and it feels slick like an oil should. The problem is that as soon as it cools it turns waxy again. That could be a good thing if you're giving a really long massage and want that slickness on your hands but it's just too waxy for me. I prefer oils that penetrate the skin and moisturize it rather than just sitting on top of it. The longer you let the oil cool and get waxy it starts to feel tacky and unpleasant. If you use this candle you'll definitely need to wash it off with warm water and soap. The waxiness only makes it harder to remove. I don't see anything romantic about trying to scrape the wax off of someones back. 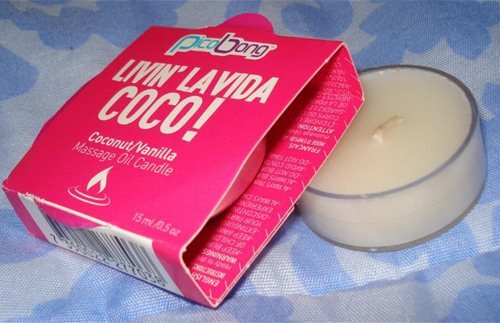 My candle is the Coconut Vanilla scent and it smells wonderful! It definitely smells like creamy vanilla coconut. The scent is very light, clean, and sweet. It's a very small candle and doesn't have a very good scent throw, even in a small room with the door closed so don't expect too much. Don't get me wrong, it smells good but it's very light and it doesn't impress me much. You really have to get close to it to smell anything. If you're expecting a strong wave of scent you'll be disappointed. I didn't get this candle to use on my partner, I actually got it for myself as an add on item. I use it on my hands and cuticles which can get very dry especially during the colder months. I also paint my nails a lot and my bare nails have really taken a beating. I thought this might be good as a cuticle oil/moisturizer. I knew when I ordered it that it was very small so I thought this would be a perfect use for that even though that's not really the intended purpose. I also love candles so why not? The wick looks too long for the candle when I first saw it, but when I lit it it shrunk down after a minute and it was fine. It takes about 20 full minutes to get a tiny pool of oil started in the middle. After about an hour it hasn't really changed much, it just tunnels down the middle. A good candle will melt all the way out to the edge and I waited for it to do that but it never did. Maybe my room was too cold? I gently blew the candle out and carefully dipped my fingertip into the oil. Then I gently massaged the oil onto my nails and into my cuticles. It worked nicely while it was still warm. As soon as it got waxy I realized I was going to have to scrub it all off which was unfortunate. I've also used this candle on my hands and elbows/knees. It works well for that but the tackiness is annoying. The packaging is very simple but colorful and cute. It looks like the candle is inside a box but it's actually just wrapped around the candle with a flap that keeps it closed. The candle is the size of a tealight, so again it's very small and you'll only get a few uses out of it. The wrapper is hotpink printed with simple directions in different languages and a minimal ingredient list. It's simple but pretty enough to give as a small gift. There's nothing sexual printed on the label or anything so you could give it to anyone. This candle contains shea butter which is a great skin moisturizer. Also, the soy wax keeps the wax at a very warm but comfortable temperature. I like this candle for what it is but it's just too small. I'd rather spend more money and get a bigger candle that will last longer and has a stronger scent. I'd recommend this if you need a gift or want to experiment with it. 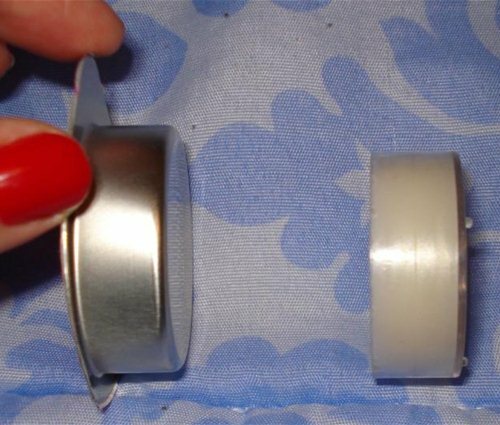 If you're already into massage candles and know your stuff you might just want to skip this. Nice review. I've never heard of using massage candles on cuticles & nails. That's interesting. Great review. I hadn't considered using the candle oil on hands. Nice tip. Too bad this was too waxy. Good review! i'm actually currently awaiting the arrival of mine and i didnt think to use this on my hands but it may be a good idea. A little sad to hear is more waxy than oily. Thanks for the review! We didn't care for this item either. I had hopes for this one, but I'll have to pass. Thank you for sharing! nice pics and great cuticle idea i use anything too! !